A review of “Everything has been material for scissors to shape” at Wing Luke Museum of the Asian Pacific American Experience, which pairs three works of contemporary art with items from the Wing Luke’s own collection. “Everything has been material for scissors to shape” is an awkward exhibition. And I mean that in the best possible way. Three bold works of contemporary art, brilliantly paired with objects owned by the Wing Luke Museum, are crammed into a series of small galleries. Immediately after entering the exhibition, you’re forced to stop short to avoid stepping on the long, gorgeous swath of fabric by Surabhi Ghosh. 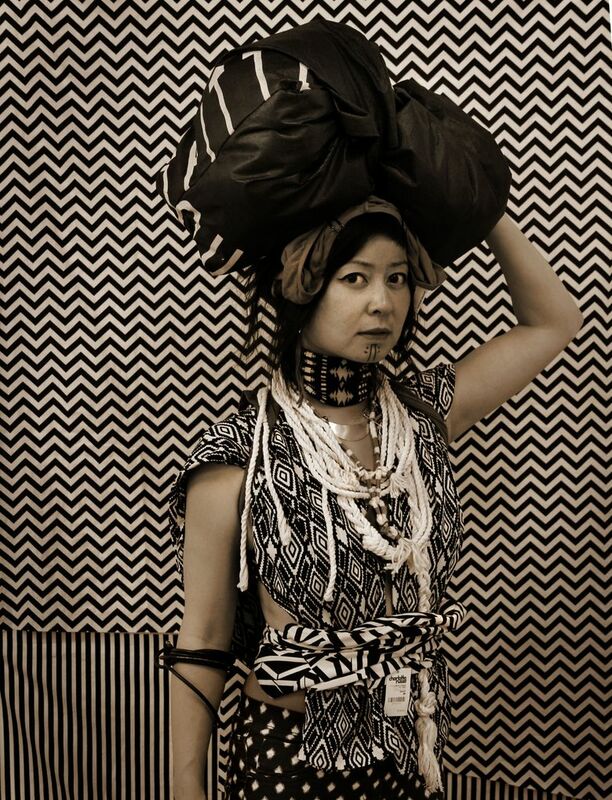 The next work, a potent photographic installation by Stephanie Syjuco, is impossible to see from a single vantage point; you have to exit the room, walk through another gallery, then re-enter through a different door to see it fully. A vibrant fiber piece by Aram Han Sifuentes shares a jumbled space with interactive educational activities. And it all works. In fact, the close quarters and fragmented experience add layers of meaning to the show’s premise: to explore how textiles shape and reveal ideas about identity, history, and labor. The sense of disruption, the need to take time to forge interpretations, the discomfort in a circumscribed space — all of it constructs a poignant meditation on power, value and cultural production. 10 a.m.-5 p.m. Tuesdays-Sundays, until 8 p.m. first Thursdays, through April 16, Wing Luke Museum of the Asian Pacific American Experience, 719 S. King St., Seattle; $9.95-$14.95 (206-623-5124 or wingluke.org). In Ghosh’s “A Hair’s Breadth, the Unfurled Sea,” beautifully patterned cloth flows across the floor and ceiling. And it’s not just any cloth. Ghosh used khadi, the fabric associated with Mahatma Gandhi and India’s fight for independence from British rule. Ghosh drew from her Gujarati Indian background, although you might not see overt references to her source material: Amar Chitra Katha comic books and the Hindu myths of “Ananta and the Sea of Milk” and “The Mahabharatha.” But an allusion to the infinite, integral to those stories, is abundantly clear in the repeated wave pattern and the sweeping loop of the textiles. Prompted by Ghosh’s use of khadi, Wiggers dove into the Wing’s collections, choosing a khadi cloth bag and pair of women’s sandals that reinforce the sense of lived — and living — histories. Two large photographs from Syjuco’s “Cargo Cult Series” face each other from the opposite walls of a narrow room. In each, the woman portrayed is the Filipina-American artist herself, dressed up in the ostensibly authentic garb of an unidentified native. Closer inspection reveals only vaguely “tribal” textiles, a necklace made of house numbers, and even an American Apparel label. In the middle of the room, a table with Chinese and Japanese baskets from the museum’s collections acts as both barricade and filter. We must peer through this display of traditional craft in order to see the photograph of ersatz authenticity, all under the gaze of the artist-as-“native.” It’s a smart and potent collaboration between artist and curator, archive and contemporary practice. The last room contains an intricately pieced fiber work by Sifuentes, the Korean-American daughter of a seamstress. 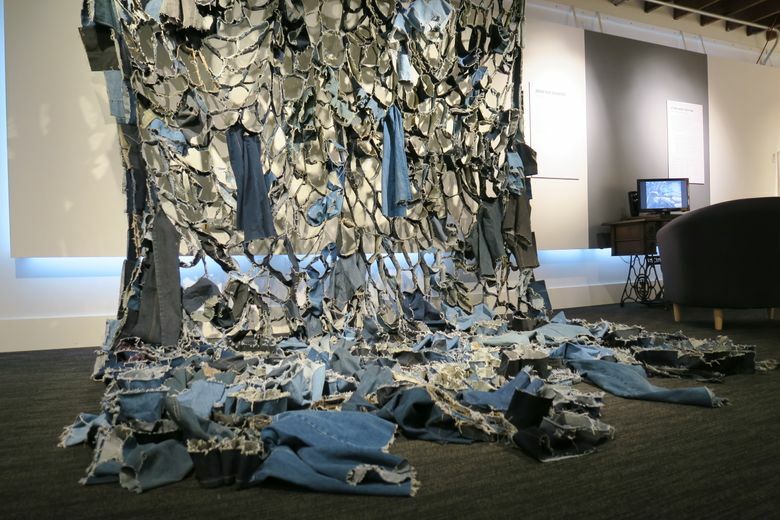 The hanging work comprises the remains of bluejeans that Sifuentes gathered from seamstresses and tailors in the Chicago area. She also collected their stories, listing where the women are from, which occupations they held before emigrating, and how much they charge to hem a pair of jeans. As the companion piece, Wiggers chose oral histories with Seattle garment workers, women who contributed to the identity and prosperity of the Pacific Northwest. In a very timely way, the exhibition explores how cultural identities are interwoven with immigration, American commerce and museum practices.